The idea for a boat which could cater for people living with disabilty was conceived by the Acorns Day Centre in 1982. It was in 1984 that a boat was purchased and the Friends of M.V. Freedom charity formed, as the organisation to administer and fund-raise to keep the boat running. The first boat operated for ten years with various skippers at the helm. After that time the existing boat could not reach the ever more stringent safety standards and in 1994 the present M.V. Freedom was purchased. Modifications were made to allow full wheelchair access and comfortable, secure seating. Further changes were carried out in early 2012 to enclose most of the deck area to make it more of an ‘all weather’ boat, so that passengers can be kept warm and dry, in inclement conditions. The Marine and Coastguard Agency, MCA, are the regulatory body who validate the safety of the vessel and there are strict rules and regulations. Regular checks are carried out on engines and equipment to be sure all is up to standard. The skippers and crew are also trained to the appropriate levels and the safely equipment, life-rafts and life jackets, must also be of a certain standard so that the vessel is as safe as possible. For the future the trustees realise that the present vessel will need to be replaced. They have therefore started a new boat fund, and are also actively seeking grants etc. towards the enormous cost of a replacement. This, it is hoped, will enable the charity to carry on with what we consider to be a valuable service of giving more vulnerable people the chance to experience a trip out on the sea. In 2012 Friends of M.V. 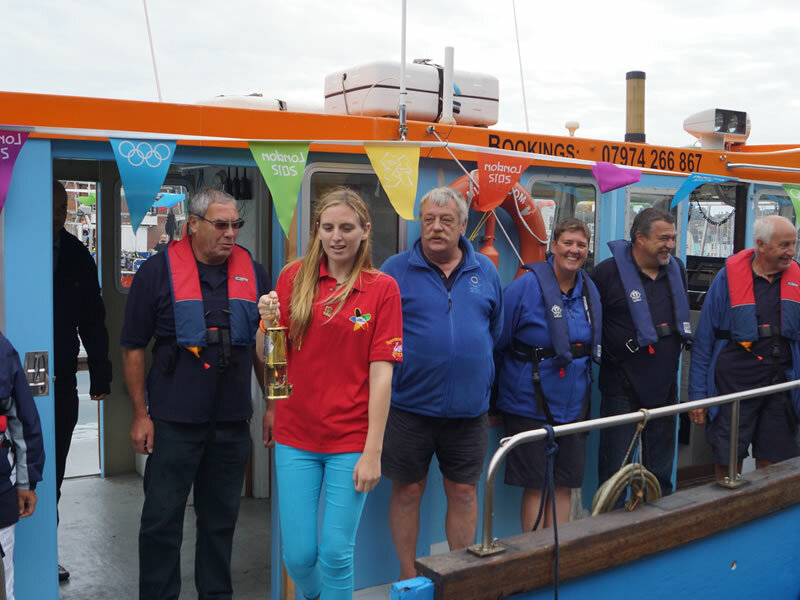 Freedom were delighted to be tasked with the honour of carrying the Olympic Torch across Weymouth Bay, signifying the start of the sailing events of the Paralympics. Friends of M.V. Freedom, 15 Church Knapp, Wyke Regis, Weymouth, Dorset DT4 9XZ. Registered charity no. 283955.